Animalife Vetrofen Intense Sachets are effective, fast-acting and convenient to help keep your horse sound and supple. Vetrofen is scientifically formulated to offer support in dealing with intense activity or recovery from physical trauma, and is proven beneficial when administered both before and after a strenuous workout to aid comfort and recovery. Vetrofen is free from Devil’s Claw and therefore safe to use with competition horses. If competing under FEI rules, the active compound in Devil’s Claw, Harpagoside, has now been moved on to the FEI controlled medication list for 2016. Vetrofen is a 100% natural, powerful antioxidant that’s fast-acting and safe, with no side-effects for either short-term or continuous use. It is the perfect support for veterinary or farrier visits, training sessions, roadwork, hillwork and competition days, plus its potent antioxidant qualities also make it the ideal support for short-term swelling and areas of inflammation. 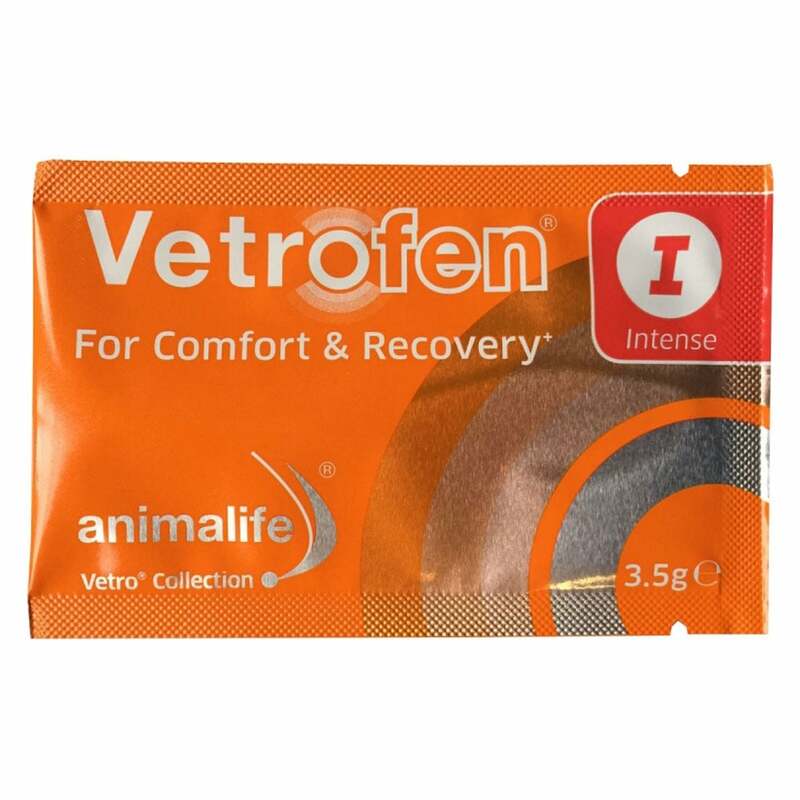 Vetrofen Intense 3.5g sachets enable you to have a product you can rely on and trust, close at hand, for those times where a little additional nutritional support is required. Given after work, when Vetrofen can help with knocks, bumps and bruises, one sachet should be given immediately after exercise. Vetrofen Intense is a super fast acting super strength targetted supplement. Vetrofen Intense is also available in larger sizes for equines; 105g and 315g tubs as well as for your pets.